Back in May 2017, three portraits of the Big Yin - Billy Connolly - or Sir Billy Connolly as he is now designated - were unveiled as giant 50 ft/15m high murals in Glasgow as a tribute to his 75th birthday. (see Billy Connolly murals in Glasgow – the city’s birthday gift to the Big Yin at 75). The portraits are by the Scottish artists - Jack Vettriano, Rachel Maclean and John Byrne. The process of creating the portraits was filmed by the BBC and can be seen on iPlayer as Billy Connolly - Portrait of a Lifetime. 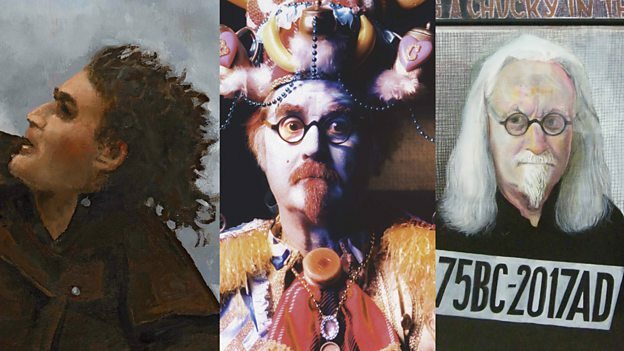 The programme involves him talking about his life with each of the artists and is worth watching if only to see how each artists addresses the conundrum of how to portray Billy Connolly. Personally I think the Vettriano portrait is absolutely awful. He dislocated his shoulder in 2015 and announced at the time that he could no longer paint. Whether or not he is back to fine fettle as an artist, the fact remains it just doesn't look like Billy Connolly! His mural can be seen on a wall end in in Dixon Street near St Enoch Square. I thought Rachel Mclean's approach to making a portrait was both ingenious and very in keeping with the sort of man Billy Connolly is. I'm not so sure I like the very dark digital print which was chosen for the mural. The video below shows the extract from the BBC programme where Billy is shown the costume he's going to wear. Her printed mural is on the Gallowgate near Barrowland Park. John Byrne is an old friend of Billy who attended Glasgow College of Art. He's unique in being both a prominent portrait artist and a playright. He has paintings in the collection of paintings hang in The Scottish National Portrait Gallery in Edinburgh, the Museum of Modern Art and the Kelvingrove Art Gallery and Museum in Glasgow. He chose to create a drawing rather than a painting of Billy. John Byrne is obviously the most accomplished draughtsman and I was very interested watching him draw Billy as he is now. However I thought it was a preliminary study for a painting and I was rather disappointed to find it wasn't going to be converted into a painting. His mural can be found on a wall end in Osborne Street, Glasgow.